Testimony given to mostly clueless congress men and women. I hope they made some money from this trip. Thank you for the invitation to discuss SETI, the Search for Extraterrestrial Intelligence. SETI experiments are trying to determine whether other intelligent, technologically capable, life exists in the universe, to answer the question "Are we alone?” or “Is anybody out there?" In the last fifty years, evidence has steadily mounted that the components and conditions we believe necessary for life are common and perhaps ubiquitous in our galaxy. Planets beyond our solar system, while once relegated to the domain of speculation, are now known to be common and numerous. Nevertheless, no evidence exists for the presence of life outside of the Earth. However, on our own planet, life is known to have arisen early and flourished. And while the propensity for evolution of intelligence from basic forms of life is not currently well understood, it appears that intelligence has imparted a strong evolutionary advantage to our own species. The possibility that life has arisen elsewhere, and perhaps evolved intelligence, is plausible and warrants scientific inquiry. From NASA’s Kepler mission we’ve learned there are roughly one trillion planets in our Milky Way galaxy; three times more planets than stars. Billions of these planets are Earth sized and in the "habitable" or so called "Goldilocks" zone - not too distant from their host star (too cold), and not too close to their star (too hot). And there are billions of other galaxies outside our Milky Way galaxy - plenty of places where life could emerge and evolve. Figure 1: Artist’s conception of Kepler 186f, an earth sized extrasolar planet in the habitable zone. There may even be primitive extraterrestrial life in our own solar system, perhaps on a moon of Jupiter or Saturn. 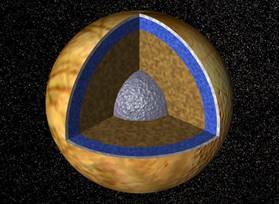 Europa, one of Jupiter's moons, is thought to have a liquid water ocean beneath its icy surface, perhaps a good environment for life as we know it. The universe is likely to be teeming with primitive life. Our growing knowledge of both terrestrial biology and extraterrestrial environments are steadily reinforcing the notion that there is nothing particularly unusual about the Earth and our Solar System. If the same processes that led to life's emergence on our own planet are at work on other worlds there is no barrier to life emerging there as well. Indeed many scientists are actively working along this line of reasoning. It may be only a few years before we have detected evidence of life beyond the Earth in spectrographic analyses of extrasolar planet atmospheres or in one of the myriad of current or proposed in-situ sampling missions exploring our Solar System. However, the deeper question of the processes of life's evolution that might lead to intelligence is addressable only by much more select means. The creation of technology, and especially environmental modification by that technology, is the only known tracer of intelligence detectable over interstellar distances. Radio communication in particular is a superb probe of extraterrestrial technology and is in fact the most detectable signature of our own technology. SETI programs are not searching for primitive life; instead, SETI programs use the world’s largest radio and optical telescopes to search for evidence of advanced civilizations and their technology on distant extrasolar planets. “guide stars” for terrestrial optical observatories. Perhaps other civilizations, if they are out there, emit radio signals, navigational beacons, laser beams, or other signals that Earthlings could detect. Such signals could be accidental - an artifact of their technology, much the way that earth's television and radar leaks into space, or perhaps extraterrestrial civilizations might transmit deliberate signals for the purpose of interstellar communication. When will Earthlings discover other civilizations? SETI experiments are in their early stages. We’ve only had radio for 100 years in the four billion year history of life on our planet. We are just now developing the tools and technologies that might detect distant civilizations. There could be radio or laser signals from extraterrestrial civilizations reaching our planet right now, but we would most likely not detect these signals with these early SETI projects. SETI is limited by computing and telescope technologies, and both of these technologies are growing rapidly. I’m optimistic in the long run, if there are signals from other civilizations, Earthlings will eventually be capable of detecting them. SETI Observing Programs: There are about two dozen scientists on our planet who conduct SETI observations. Two thirds of these researchers are in the USA. Professor Paul Horowitz leads an "optical SETI" program at Harvard, scanning the sky for laser signals. The possibility of detecting optical and infrared emission from extraterrestrial lasers was first suggested in 1961, well before the widespread proliferation of human laser technology in the later 20th century. In the last two decades, both pulsed and spectroscopic optical SETI searches have been conducted. The field of pulsed optical SETI rests on the observation that humanity could build a pulsed optical transmitter (using, for example, a National Ignition Facility-like laser coupled to a large optical telescope) that would easily be detectable at interstellar distances. When detected, the nanosecond-long pulses would be a factor of about 1000 brighter than the host star of the transmitter during their brief flashes. Such nanosecond-scale optical pulses are not known to occur naturally from any astronomical source. Figure 3: Harvard's Optical SETI observatory scans the sky for laser signals from distant civilizations. 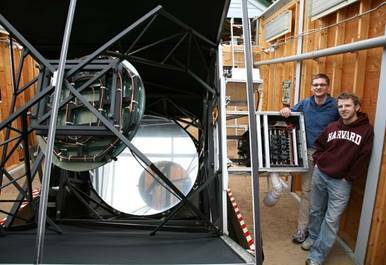 The 72 inch diameter telescope is shown with graduate students Curtis Mead (right), and Andrew Howard (left), now an extrasolar-planet-hunting Professor of Astronomy at the University of Hawaii. Harvard is using their innovative telescope and instrumentation to conduct the first all sky survey for laser signals. The SETI Institute has led a number of SETI programs, and is currently conducting a search for radio signals using the Allen Telescope Array in Northern California. My colleague, Seth Shostak, from the SETI Institute, will hopefully review this project in his testimony today. 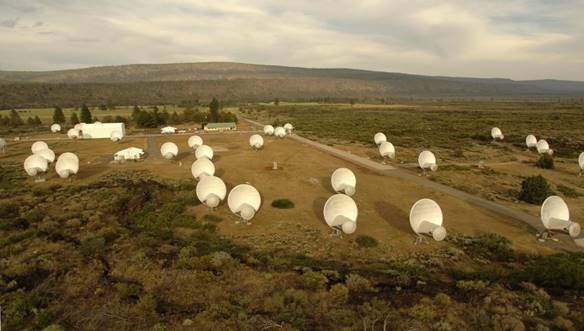 Figure 4: The Allen Telescope Array, in Northern California, is used by the SETI Institute to search for radio signals from extraterrestrial civilizations. The Berkeley SETI Research Center at the University of California and our collaborators are conducting a variety of radio, infrared, and optical SETI searches using nine different observatories, including the National Astronomy and Ionosphere Center’s Arecibo telescope in Puerto Rico, the National Radio Astronomy Observatory’s Robert C. Byrd Green Bank telescope in West Virginia, the Keck telescope in Hawaii, several telescopes at Lick Observatory in California, the Infrared Spatial Interferometer in California, the Combined Array for Research in Millimeter-wave Astronomy in California, and the Low Frequency Array in Europe. Berkeley's most well-known SETI project is SETI@home. SETI@home uses several telescopes to survey the sky, but most of the data comes from the world's largest single dish radio telescope, the 1000 foot diameter Arecibo telescope. The Arecibo Observatory is the most sensitive radio telescope on the planet, and as such represents our best chance of detecting the faintest radio whispers from advanced civilizations. Most scientists would be lucky to get a day or two each year to conduct observations using the Arecibo telescope, but our group pioneered a technique to use the telescope at the same time that other scientists are using the telescope for their own research. Using this “piggyback” or “commensal” SETI strategy, we are able to observe almost all year round on the world’s largest telescope. 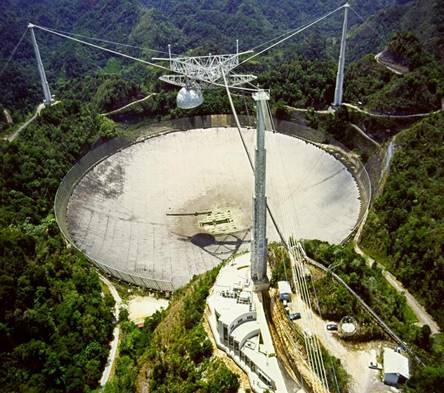 Figure 5: The National Astronomy and Ionosphere Center’s 1000 foot diameter telescope in Arecibo, Puerto Rico. 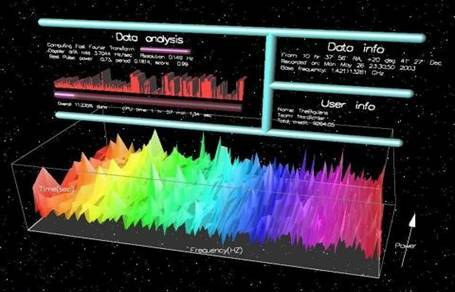 To analyze the incoming data from the Arecibo telescope requires an enormous amount of computing power, which is needed to search through the many different places on the sky, frequencies (or “channels”) and signal types (pulses, narrow and wide bandwidth signals, drifting signals…) that another civilization might be broadcasting. To analyze the hundreds of terabytes of data we collect, we ask volunteers around the world for help. Utilizing their laptop and desktop computers at home, office or school, volunteers can download the SETI@home screensaver program. When a volunteer’s computer isn’t being used, the screensaver program automatically downloads a small chunk of our data and goes to work searching for a rich variety of signal types. When the analysis is completed, typically after a few days, the program sends back the results of the analysis to our database, and the screen saver program gets a new chunk of data to work on. Millions of volunteers, in 226 countries, have downloaded the SETI@home screensaver. The SETI@home volunteers have formed one our planet's most powerful supercomputers and have enabled the world’s most sensitive SETI search. SETI@home project scientist Dr. Eric Korpela is currently testing new SETI@home software that can run on cell phones, so that millions more will be able to participate in a global science project, allowing us to conduct our most thorough search ever. One of the new SETI programs our research group is launching this year is called “panchromatic SETI”. Led by Dr. Andrew Siemion, the project will search very nearby stars as well as stars determined to be most likely to host a solar-like exoplanet system. The experiment will use six different telescopes equipped with powerful spectrometers capable of examining five billion radio channels simultaneously and specialized infrared and visible light detectors, spanning the electromagnetic spectrum from the lowest frequencies that can pass through our planet’s ionosphere, through infrared, and up to optical light – from 50 MHz to 500 THz. This experiment is targeting a wide range of possible signal types indicative of the presence of advanced technology. These observations will be the most sensitive and comprehensive SETI searches of these stars ever performed. Figure 7: Wavelengths covered in the new “Panchromatic SETI Project” observing nearby stars, plotted against “atmospheric opacity,” a measure of the amount of light that can get through the Earth’s atmosphere. Several optical, infrared, and radio telescopes will be used to cover many of the wavelength bands that get through the Earth’s atmosphere. Another new project we are working on this year is dubbed “eavesdropping SETI.” Someday we will colonize Mars – if so, we will want to communicate with people and machines on Mars or other planets in our solar system. Similarly, perhaps other civilizations are sending radio or laser signals between planets within their own solar system. 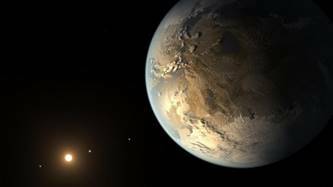 Using recent data from NASA’s Kepler mission, we can predict exactly when two extrasolar planets will be lined up with Earth, and we can schedule our observations to attempt to detect another civilization’s inter-planetary communication. Figure 8: An illustration of Berkeley’s “eavesdropping SETI” project targeting a conjunction of two planets in an exoplanetary system along a common line of sight. The paradigm envisioned here is that one or more planets in a system may be involved in communication or remote-sensing within their orbital plane. Figure 9: The National Radio Astronomy Observatory’s Robert C. Byrd telescope in Green Bank, West Virginia, utilized by the University of California Berkeley’s eavesdropping and panchromatic SETI projects. The 100 meter diameter telescope is the largest fully steerable radio telescope on the planet, and with observing capabilities extending up to 100 GHz. Education and Outreach: SETI researchers haven’t found ET yet, but there have been many spin offs and interesting discoveries along the way. SETI@home has engaged millions of volunteers in a global science project. Thousands of students are running SETI@home as part of their science curriculum. The question “Are we alone?” touches on many disciplines, including physics, astronomy, chemistry, biology, engineering, and computer science. Volunteer computing and citizen science: Led by Dr. David Anderson, our SETI group developed general purpose open source software for public participation supercomputing. Using this software, millions of volunteers are participating in dozens of scientific computing projects, including malaria, cancer, and HIV drug research, climate modeling, pulsar searching, protein folding and SETI. Participants can use their spare computing cycles for the science projects they are most interested in. Figure 10: Three of the many volunteer computing projects that use software derived from SETI@home. SETI Instrumentation Spin Offs: The powerful signal processing instrumentation that we originally developed for SETI is now widely used by radio astronomy observatories. These SETI instruments were adapted and used to produce the first images of the black hole at the center of our galaxy. The SETI instrumentation was also adapted and used to discover a planet made of solid diamond, as well as discover the most massive neutron star ever found, leading to an improved understanding of high density matter. The instruments have even been used in brain research, which may eventually lead to the control of prosthetic limbs. Self-Driving Cars: SETI has trained students in electrical engineering, computer science, physics, and astronomy. One of our engineering graduate students, Pierre Droz, started a company that developed self-driving cars and tractors. The company delivered a pizza without a driver. Google purchased Droz’s company. Despite widespread public support, there’s not much funding for SETI research, and the funding fluctuates wildly. Our SETI program at the University of California currently receives roughly a million dollars a year in research grants, from NASA, the National Science Foundation, the Templeton Foundation, and other private donors. Very few scientists and institutions work on SETI projects – there are about 24 scientists on the planet that carry out SETI observations. We are working to train new researchers, and help other universities and observatories launch new SETI projects. The two best radio telescopes on the planet for SETI are in a budget crisis. The NSF is planning to discontinue funding for the Robert C. Byrd Green Bank telescope in West Virginia, and NSF astronomy has had to drastically cut support of the Arecibo telescope as well. Luckily, Arecibo is used for both atmospheric and asteroid research (Arecibo’s radar can measure asteroid orbits extremely precisely, and can predict if Earth is in danger of being hit by an asteroid), so NASA and other NSF divisions have been able to step up their support and keep the Arecibo telescope running so far. However, the budget is extremely tight, and both telescopes are in jeopardy. Meanwhile, China is building an extremely large radio telescope, 500 meters in diameter (larger than Arecibo), and the multi-billion dollar International Square Kilometer Array Telescope project is well underway. These may soon become the world’s preeminent radio SETI observatories, but the United States is not involved in either of them.